One of my new year's resolutions is to crochet an item a week. Now when I say Item I'm not talking blankets, sweaters, or anything too intricate. No, I want to crochet a dishcloth or swiffer cover a week. We go through both like crazy so any way to save money and create reusable items I'm all about! 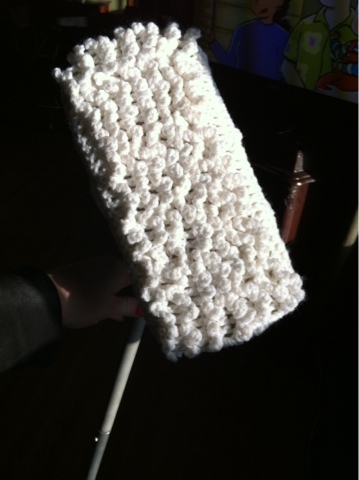 A while back I posted about wanting to make my own Swiffer covers. Last night I finally made good on my word. Realize I am a beginner with crochet, my gauge is usually all wrong and I miscount my stitches. With that said my first go round turned out pretty darn good. It works great too! (BTW it took about 2 hours to make) You can find the pattern I used here. It works! And it is reversible! Oh I really like that one! I have one that I tie on. That one wouldn't work for my wet jet, though. I need a good one for the wet jet. What a great idea! I am a complete crochet novice and gave up last time I tried to make anything but this is making me what to give it another go. Thanks for sharing! Thanks for the comments! 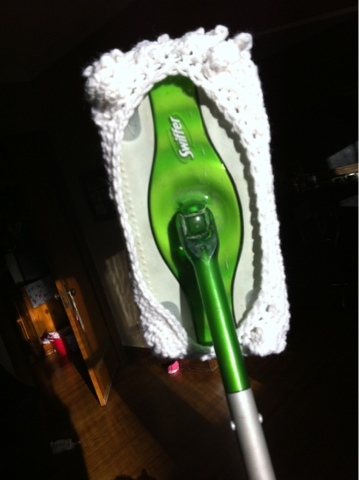 Last night my husband commented "these things work tons better than the actual Swiffer pads." Yes, I did a happy dance.